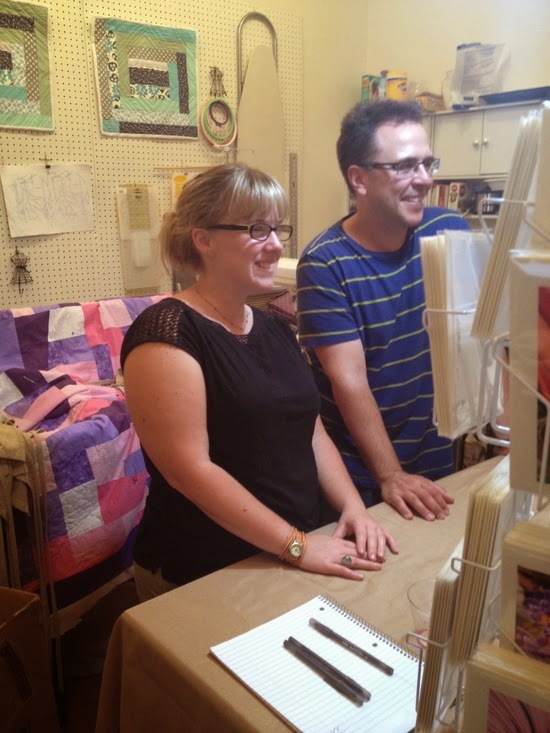 Stephanie Cave Studio is located right in the heart of JP Centre/South Main Streets First Thursdays Art Walk. 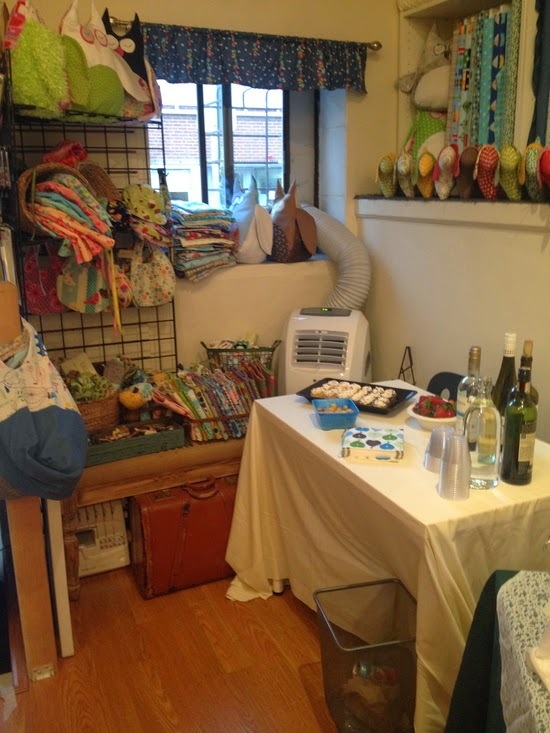 I had the pleasure of holding a trunk show in Stephanie’s studio for September’s First Thursday, along with two other of Boston Handmade’s artists, Chris Lang of Chris Lang Photography, and Melissa Glick of Hacker Junk Creations. It was a lovely night complete with lively conversation, wine, and light refreshments. 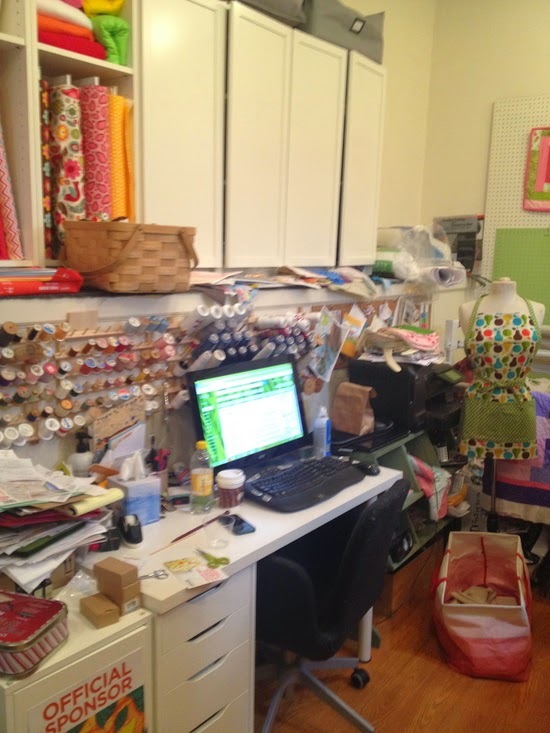 I have long been fascinated with artist workspace, and Stephanie’s is no exception. Located on Green Street, right around the corner from the famous J.P. Licks, it appears a hole in the wall at first, with an attractive green sign that invites you right in. Her studio is bright and well lit, and buzzes with creative energy. 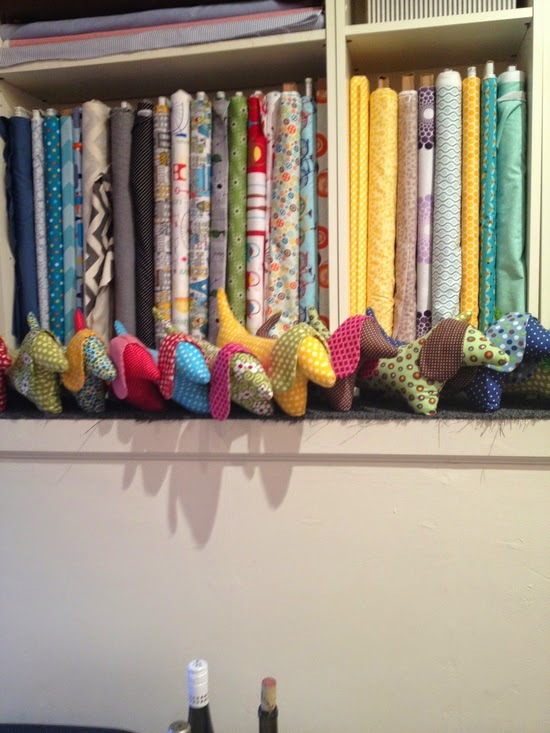 Stephanie is very orderly, and her studio is well organized. Bolts of brightly colored textiles stand upright around the room in such a way, one cannot help but want to start color matching and designing with the different available patterns. Spools and bobbins in a myriad of hues of thread are neatly together, ready to stitch the fabrics together to create anything from a stuffed owl to a fan, to a skirt. Quilts in progress are draped in the back, almost ready to keep someone’s bed warm and cozy. I’ll bet you can’t guess what Stephanie’s favorite dog breed! While sewing may be an art that has been around for centuries, do not doubt Stephanie has embraced the technology of the modern world. You cannot miss the antique Singer sewing machine sitting next to the large monitor of her computer. The combination embraces the domestic arts of the seamstresses of the past with a very modern thinking woman. While my medium of choice has become metal, I grew up in the fabric stores across Massachusetts. My mother is a seamstress, and I learned how to sew at a young age. During the hours I was present in Stephanie’s studio, I had a mad desire to create something with the beautiful yards of cotton throughout the room. The fact I managed to refrain is a sign of great restraint on my part! First Thursdays are continuing! We hope you will stop by, check out Stephanie’s studio, and see what other trunk shows will be showing up in the months to come! I also hope you will take the time to check out the works of Chris Lang Photography and Hacker Junk Creations. Chris has a keen eye for the perfect shot, capturing the beauty of the everyday world around us. Melissa’s work is fun and vibrant. 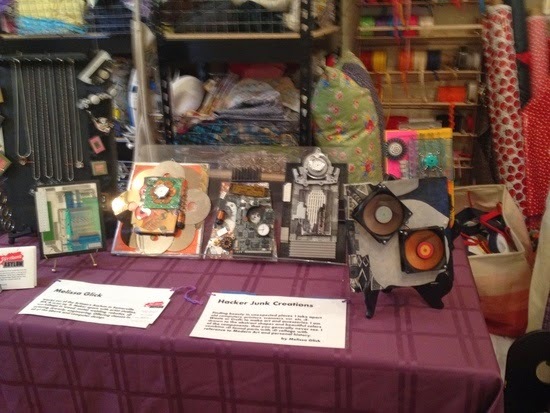 Instead of creating computer digital art, She brings us art made from the actual computer parts. Melissa notes she wasn’t aware how interesting the inner workings of a computer were until someone opened one up and showed her what was inside! Stephanie Cave’s Studio can be found at 7 Green Street, Jamaica Plain. Hope I’ll see you there! Just for accuracy's sake, no one ever "showed me what was inside a computer." I taught myself how to open them, assembled all the tools, and started dis-assembling!